04-21-2014 fatalhasreturned Description Nathan Spencer returns as the daring elite soldier equipped with special bionic abilities. Spencer will have to face his greatest challenge yet as General Sabio, a new technologically sophisticated foe, is on the brink of launching a deadly missile attack. Nathan Spencer will make use of his trademark tool â€“ his bionic grappling hook â€“ to grab, swing and leap through series of lush new environments. Heâ€™ll be met by plenty of gun-toting soldiers and mechanized threats ready to give him a hostile greeting. 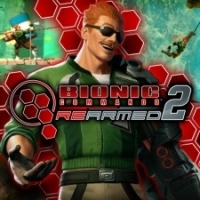 Bionic Commando Rearmed 2 improves upon the visual achievements of its predecessor with the addition of more detailed character models, textures, and vibrant colors. New player mechanics will add another strategic layer of platforming to the overall experience and the famous bionic arm will be getting a major makeover delivering a more dynamic bionic experience to the player. This is a list of VGCollect users who have Bionic Commando: Rearmed 2 in their Collection. This is a list of VGCollect users who have Bionic Commando: Rearmed 2 in their Sell List. This is a list of VGCollect users who have Bionic Commando: Rearmed 2 in their Wish List.